"Sexual and reproductive health services are fragmented, often duplicated and inefficient." Weak political commitment, inadequate resources and persistent discrimination against women and girls: these are just some reasons that many countries still don’t openly and comprehensively address sexual and reproductive health and rights. This is borne out by figures. Each year in developing countries, including those in Africa, more than 30 million women don’t give birth at a health facility. More than 45 million have inadequate or no antenatal care. And over 200 million women want to avoid pregnancy but don’t have access to modern contraceptive methods. The United Nations’ Sustainable Development Goals -– introduced in 2015 –- were created to address many of these problems. The goals recognise that sexual and reproductive health and rights are fundamental to people’s health and survival, to gender equality and to the well-being of humanity. But many countries on the continent still have a long way to go before they make any headway with these goals . In a bid to boost these fundamental rights, the Guttmacher-Lancet Commission on Sexual and Reproductive Health and Rights was convened in 2016. I was one of the experts from across the world who served on the commission to try and find new ways to achieve universal sexual and reproductive health. Our main finding – released this year – is that sexual and reproductive health services are fragmented, often duplicated and inefficient. As part of the findings we’ve developed a set of evidence based interventions that’s rooted in human rights. These are a direct response to the gaps identified by the commission. It’s hoped that by plugging these gaps, we can contribute to achieving the Sustainable Development Goals by 2030. After all, advancing sexual and reproductive health rights -– particularly among women – will help address the gender based disparities in health and other sectors. The commission’s findings address commonly recognised components of sexual and reproductive health like contraceptive services, maternal and newborn care, and the prevention and treatment of HIV/AIDS. - preventing, detecting and managing gender-based violence, infertility and reproductive cancers. The interventions come in different forms. One example involves incorporating information on how to prevent sexually transmitted infections, contraception and sexual well-being into adolescent health programming. This upholds young people’s right to self-determination about their sexuality and results in improved health outcomes. Another intervention is offering contraceptive counselling as part of postpartum and post-abortion care. 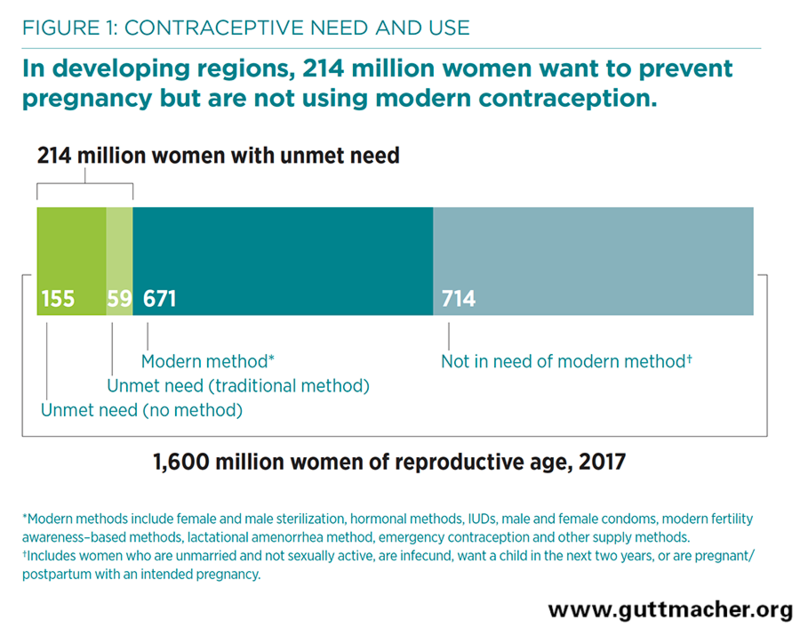 Each year in developing regions, more than 200 million women want to avoid pregnancy but don’t use modern contraception methods. Giving them this access allows them to access contraceptives easily and reduces the risk of unintended pregnancy. This intervention could reduce unintended pregnancies by 75% from 89 million in 2017 to 22 million. And it would only come at a cost of USD$ 9 per person per year. This is a modest cost, considering that half of this is already being spent to cover the costs of current levels of care. Other interventions may have to involve amending a country’s laws or policies. For instance, in 2010 the Kenyan government passed laws that allow abortions to happen under certain circumstances. But eight years later health professionals are still reluctant to perform the procedure as they fear legal consequences. Why? Because the penal code hasn’t yet been revised and so they might still be held guilty of a crime. The result of this gap between law and paperwork is that there were close to half a million unsafe abortions in Kenya in 2012. At least 100 000 of those women needed to be treated in hospital and roughly a quarter died due to complications. All of this shows that while achieving universal access to sexual and reproductive health and rights is ambitious it’s also achievable and affordable. There are several steps that governments need to take to tackle these issues. The first is that governments, multilateral organisations and advocates should embrace the commission’s recommended package of essential sexual and reproductive health interventions and push for its inclusion in national and international planning. It’s also crucial for health ministries and service providers to consider how and where to introduce these interventions into the health care system. They must also work out how best to integrate sexual and reproductive health interventions into other health care services. Many developing countries are not currently equipped to provide the full spectrum of interventions. But that does not preclude them from committing to achieving universal access to sexual and reproductive health and rights and to making continual and steady progress, regardless of their starting point. * Dr Zeba Sathar, who is the Population Council’s Country Director in Islamabad, Pakistan, also contributed to writing this article.